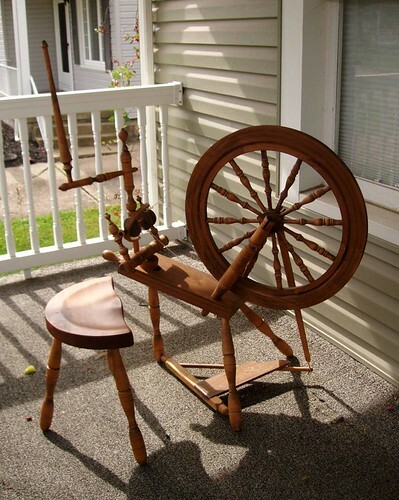 Currently I have this beautiful Country Craftsman Spinning Wheel sitting in my living room. It was hand-crafted by Joseph Franzek, Jr. from Littleton, Massachusetts. Despite its alluring charm, I do not have a use for it. I am hoping to help it find a new forever home this weekend at the Autumn Fiber Festival in Ashland, OH. I am asking $325 and it comes with a matching stool and distaff. Stop in my booth to give it a whirl. Detta’s Spindle has a few accessories available. Hummm, flyer drive…? Double drive…? This could be all me!? Double drive! Single treadle. It’s so beautiful! The wheel comes off for easier transport. Stands a bit taller than my Ashford Traditional. Unfortunately there is only one bobbin. I found them for sale online. Has the spinning wheel sold yet ?? Previous Previous post: new pattern is complete!